The coralline red algae Clathromorphum compactum and Lithothamnion glaciale have covered the floor of the Mosselbukta in Svalbard with a bright purple blanket. Just like corals, these plants form robust calcium carbonate structures that serve as a basis for sea stars, sea urchins and other algae species. On a dive with research submersible JAGO, scientists take a closer look at the red algae reef. As ocean acidification increases, it will be more difficult for the marine habitat former to maintain its function: Lithothamnion glaciale builds its robust cell walls from a form of calcite that contains a high amount of magnesium – up to now. According to laboratory experiments, less magnesium is incorporated into the cell walls, the algae are thinner and their structure changes under elevated concentrations of carbon dioxide. They lose their elasticity and hardness and can be damaged more easily. 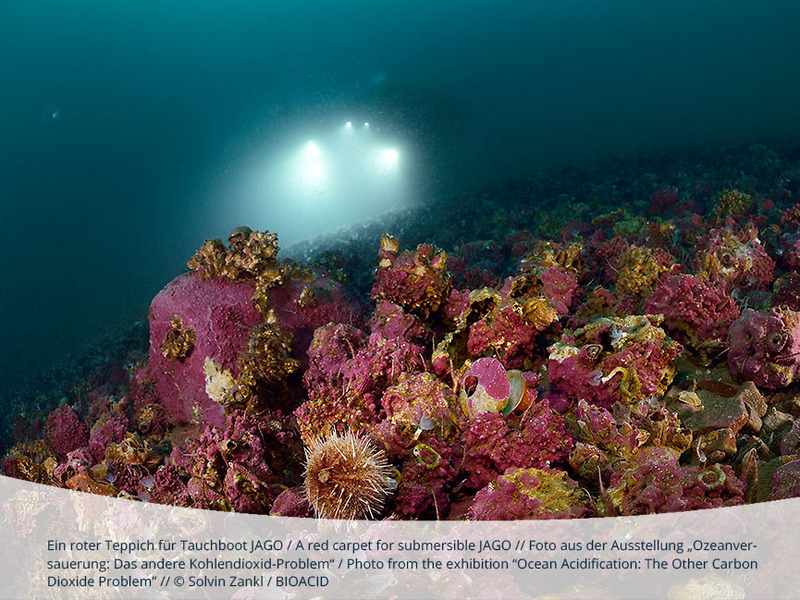 This picture was not taken by a person diving down from research vessel MARIA S. MERIAN, but by a photo robot designed and built by Solvin Zankl.